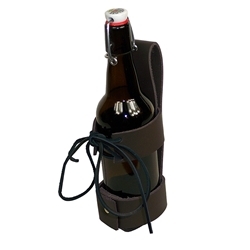 A new heavy duty, quality leather drink holder (for cans, cups or bottles) with an adjustable, leather thong mounting system. Design allows you to easily attach the holder to your Belt. This leather holder is made from our sturdy, 8oz leather with thong closure system. Drink holder is approximately 3" in diameter and designed to carry a variety of popular sized beverage cans, cups, bottles. This drink holder would be a great addition to your medieval, renaissance or pirate gear. Get one now and carry your drink in style!